Today pattern is brought to you by Susi of Susi Haekelt. 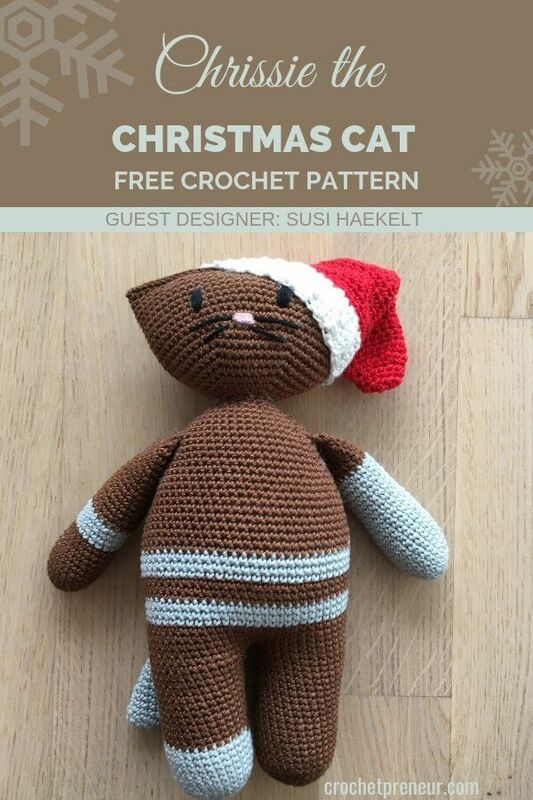 It’s an amigurumi Christmas cat crochet pattern that is just purrrfrect. SLST, break yarn, close the little hole with the yarn and sew in all ends. For the whisker, stitch 2 whiskers on each side of the nose. Sew the head to the body (RND1 facing the body). Sew the tail to the back of the body (RND 39-41) – choose the beginning of the rounds as the backside as color changes might be visible here). Sew the hat to the head so that it sits on one side of the head (see photo). Congratulations, you just finished your Christmas Cat doll. This pattern and its images are copyright protected and the sole property of Susanne Gessl. The written pattern is for personal use only. Purchase of the pattern does not entitle the purchaser to redistribute, transfer, or sell the pattern or to alter it in order to claim as his/her own. If you choose to sell the finished product, please credit @susi_haekelt as the designer and provide a link to https://susi-haekelt.at in your online listing. I hope you enjoy your finished product! If you have any trouble with the pattern, please e-mail me at susi@susi-haekelt.at and I’ll do whatever I can to help. I know you’re going to love making Chrissie the Christmas Cat and I so look forward to seeing your finished product. Her own yarn story started with a baby blanket in 2015 and she hasn’t put that hook down since. As a maker and mum of 2, she spends every free minute designing and creating gifts for her own children. Now, she also helps mums who want to make colorful and unique toys that their kids will love for years to come. With her easy to follow patterns, everyone can make beautiful items in just a few hours. Her favorite crochet projects are Amigurumi and her favorite place to hang out online is Instagram where, every Tuesday, she shares the best ideas for using your scrap yarn. Purchase the pattern bundle because it’s an amazing deal. Sign up for the Crochetpreneur VIP Crocheter Newsletter so you don’t miss any of the incredible happenings here on this site. Go visit the designer’s website and check out all her designs.